Cascading Style Sheets (CSS) are used in Web development to format Web page text, layout Web pages, and enhance hyperlinks. Cascading Style Sheets can also be used to create more dynamic effects such as tooltips, the pop-up text messages that appear when an HTML element is moused over. Move your mouse over the image below. The box that pops up was created using only Cascading Style Sheets. This is a Monarch butterfly. 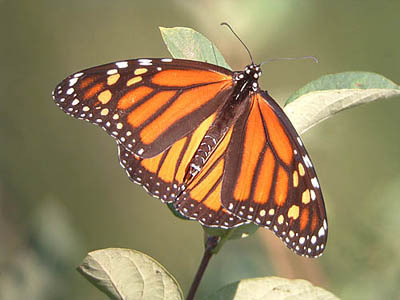 Monarchs belong to the family Daniidae, the so-called milkweed butterflies. Like other members of the Daniidae, Monarch caterpillars feed almost exclusively on plants in the milkweed family, hence the name milkweed butterflies. In the above HTML code the image is nested within a <div> tag and an <a> tag. Since we're using the <a> tag only for this effect and not a working hyperlink, the href attribute is set to the dummy value "#". The <a> tag itself is critically important for reasons explained below. Note also that the <span> tag is nested within the <div> and <a> tags. The text within the <span> tag is the text that will appear in the actual tooltip. The other issue is browser compatability. I've tested this code on Opera 9.64, Firefox 3.5.2, and Internet Explorer 8 on a PC, and Safari 1.3.2 and Opera 9.64 on a Mac and it works fine. In theory any browser that understands Cascading Style Sheets, Level 2.1 should be able to render this code correctly but there could be exceptions. If you experience problems with this code please contact me, Robert D. Hughes, and let me know.